face? I was not the best counselor in those failing days. an accomplished task she had learned long ago. them words youse foolin’ around with don’t make no sense. you better leave ’em alone you hear? writin’ down what you think is right. Whoever told you you had the right to decide bad and good? unless it’s going to bring you some silver. you done scribbled down like chicken scratch. what or how much money white people make. And I don’t want to hear nothin’ ’bout no fame. Attention ain’t no good when you’re dead. It don’t make no sense. or how many baths you refuse to take. you ain’t got nothin’ to say. And I didn’t have to go to no fool college to learn that. since I knowed exactly who I was. So if I tell you I hand dipped snuff, look for the box. Boy, where is ya goin’? I’m talkin’ to you. You better come back here and listen. Lord, Lord, these children are gonna be the death of us all. Not that we ain’t givin’ ’em plenty of kindlin’ wood. Herbert Woodward Martin, born in 1933, served as professor of English and poet-in-residence at the University of Dayton in Ohio, United States of America, for more than three decades where he taught creative writing and African-American literature. 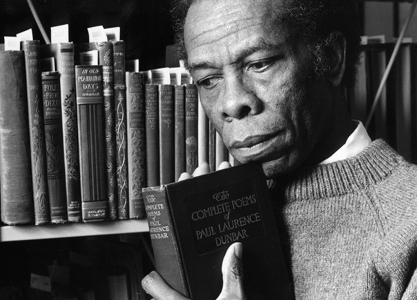 He is the author of nine volumes of poetry and has devoted decades to editing and giving performances of the works of the poet and novelist Paul Laurence Dunbar (1872-1906).